How the manufacturer turns the cotton into yarn ready for the weaver. This is called spinning. Shall we study how it is done? Perhaps there is some one in your class who has visited a spinning mill and can tell how cotton is cleaned and made ready for weaving. This is what the girls of the Sewing League of Pleasant Valley saw the day they went to visit the mill. The Camp Fire girls went the same day, and Miss Ashly, their guardian, said that what they learned would count as an honor. How cotton is prepared for spinning. The girls went to the lower floor where the cotton is received. They saw the bags and iron bands removed and the cotton pulled apart by a queer machine called a cotton opener, or bale breaker, for you remember the cotton was pressed very hard before being shipped. The cotton is then placed in pickers, or machines which blow it apart and blow out the leaves and dust and dirt. As the cotton leaves this machine, it looks like a big piece (6 ft. wide) of cotton batting rolled in a large roll. It looks soft and clean. Then the girls watched the men place this roll at the back of the next machine, called a carding machine (Fig. 45). Here it was cleaned some more; and such a wonderful thing happened. As it left the machine instead of coming out as a lap of the roll of cotton like it went in, it came out in a long thick coil which looked like a rope, and there were tall round cans ready to receive this continuous line of cotton rope. How soft and beautiful it looked! What wonderful machines the manufacturer had. Some one must have made them. Can you find out who made the first loom run by machinery? John Alden looked it up in the encyclopedia. Do you know who invented the first spinning machine ? Fig. 45. - The cotton carding machine, which cleans the cotton. Courtesy of Leonard & Green, Boston. Fig. 46. 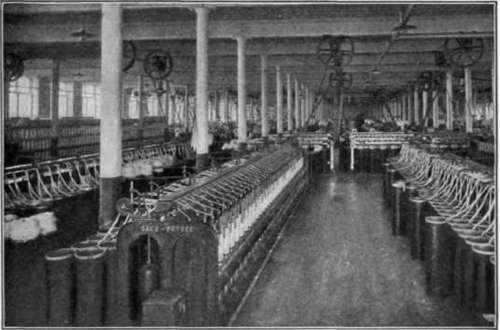 - A cotton spinning room. Then the girls visited ever so many machines which wound this cotton rope on spools. 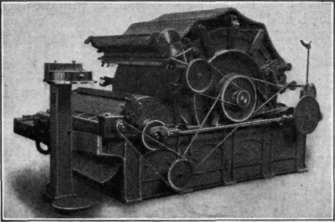 Each machine made the rope thinner and finer until it was drawn out as thin and round as the manufacturer wished (Fig. 46). Barbara Oakes noticed this: that these spinning machines not only drew out the cotton rope and made it thinner, but put in a twist which prevented it from breaking so easily. Do you remember how the cotton fiber looked under the microscope? The twist in the fiber helps in the spinning. Isn't it wonderful to think that such tiny fibers can be made into spinning yarns, and yarns woven into cloth? How cotton is spun. Did you ever see any one spin by hand? One day the Girls' League went to Marjorie Allen's grandmother's house. 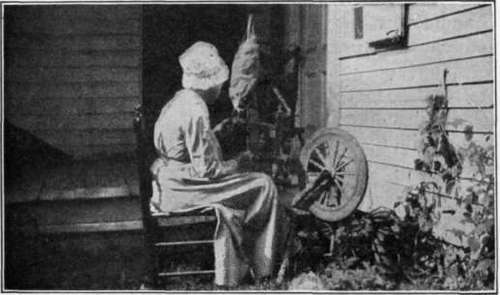 She took the girls to the attic and showed them her grandmother's spinning wheels (Fig. 47). There was a large one for spinning woolen yarn. This she called the great wheel. 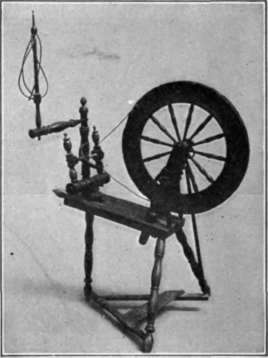 Then there was a small one called the flax wheel (Fig. 48) for spinning flax, or linen, into yarn for weaving. Grandmother sat down and showed them how to spin (Fig. 49). She pressed her foot on the treadle just like a sewing machine; and the wheels went round. The flax was on a little holder called a distaff. See the pictures (Figs. 48 and 49) of the wheels. She held and drew the flax while the wheels of the machine put in the twist. That is just what the modern spinning machine does, but it can accomplish much more in an hour than grandmother did in a day. Still it is a great satisfaction to possess some of the beautiful old textiles spun and woven by grandmother's hands. The girls had the pleasure of opening a great chest in the attic and looking at the hand-woven sheets and coverlets which Grandmother Allen prizes so highly. Fig. 47. - Grandmother Allen's wheel used for spinning wool. Courtesy of the Metropolitan Museun of Art. Fig. 48. - The flax wheel. Barbara Oakes and Mollie Stark fairly clapped their hands and said, "How beautiful the colors are." The coverlets were made of wool and cotton yarns. Grandmother showed the girls the hand cards which she used when a girl in helping her mother prepare wool into carded rolls for spinning. Do you remember that the cotton at the factory passed through a carding machine to be cleaned and made into a cotton rope? Courtesy of Miss Mary E. Hoag. Fig. 49. - Grandmother Allen sat at her flax wheel and showed the girls how to spin. Grandmother told the girls she used to do the same for wool. She used the little hand cards and drew the boards with the fine teeth back and forth to clean the fibers, and then made little rolls for the great wheel to spin. The picture (Fig. 50) shows how the hand cards are used. 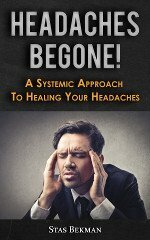 Wasn't that a long, tedious process? Perhaps at your school you can have an exhibit of old industrial things once used in the home. Maybe your grandmother has something in the attic - some cards, or wheels, or old hand-woven materials. If you have a Girls' Sewing League, the girls will, perhaps, send out invitations and invite the mothers and grandmothers. The girls can prepare some coffee and cookies at school to serve the afternoon of the exhibit. The Pleasant Valley girls had such an afternoon entertainment and earned five dollars for their school fund. They will probably buy some dishes for the school lunch. Fig. 50. 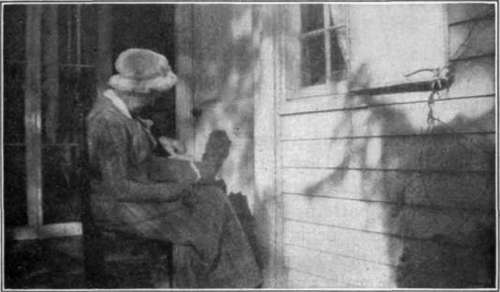 - Grandmother Allen carding wool by hand. 1. Try to find some pictures of very primitive spinning. Can you make a spindle? 2. What does the process of carding do to the cotton or wool ? 3. Plan an exhibition of old coverlets and other old hand-woven textiles. Invite your parents and friends.